Bono Before And After Plastic Surgery? Ah yes, its the magnificently talented Irish singer, musician and frontman of the tremendously successful rock band U2, Mr. Bono. And when the savvy sunglasses wearing saint isn't rocking the world with mystical melodious, hes putting forth an effort to rid the world of impoverished children. And now for the reason your here... A few years ago, there was some buzz going around about Bono undergoing a little plastic surgery of his own, after the singer was spotted without his trademark sunglasses, looking a little polished around the eyes. 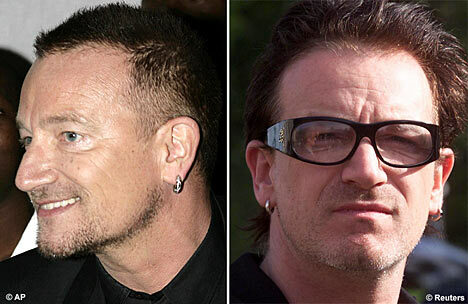 There was even a handful of certified plastic surgeons who gave their two cents about Bono's before and after look. I definitely think Bono has had lower blepharoplast, lower eyelid surgery, which the plaster covered up back in December. - Dr Lucy Glancey. As well as the eye lift, he has probably had Botox to lift his brows because there is still a skin overhang in this area which wouldn't be there if he had had an upper blepharoplasty. With that being said, Bono has never actually admitted to undergoing any type cosmetic makeover whatsoever, however, that's usually the case with celebrities who have in fact undergone plastic surgery. Clearly this isn't an open and shut case of plastic surgery, but the before and after photo alone, is enough reason for debate. This writer lacks basic grammar skills such as putting apostrophes in contractions. Also, the second sentence kind of makes it sound like Bono offs poor kids.